Pearl Elliott’s passion is reflected in all that she does. As Director of Fun at Arizona Outdoor Fun, she delivers. Pearl Elliott’s passion, positive attitude and impeccable customer service skills are reflected in all that she does. 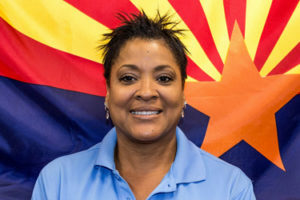 And with the job title of Director of Fun at Arizona Outdoor Fun, she truly delivers on her dedication to going above and beyond what is expected. Pearl recently took the time to talk about all that Arizona Outdoor Fun has to offer. Guided Jet Ski tour: This two-hour adventure is a great way to explore old Waddell dam and new Waddell dam as your guide explains the long history behind these structures. You’ll see native plant life along the shore and maybe even catch a glimpse of javelinas or bald eagles that have stopped at the water’s edge for a drink. Enjoy 30 minutes of free ride time at Balance Rock Island and feel the spray of the water in your hair as you cool off. Guided Paddle Board tour: Paddle board tours are a great way to work your core and get a leisurely view of Lake Pleasant at the same time. These are naturally beautiful, unspoiled scenic destinations you and your family will love. Even first-time paddle boarders will enjoy this adventure as they learn a new skill and experience the stunning scenery at the old and new Waddell dams. “I definitely recommend our Sunset ATV/UTV tour. There is no better way to see Phoenix during the summer than by venturing on an off-road vehicle,” Pearl said. “You get a front row seat to some of the most spectacular sunsets our state has to offer and escape the heat. The Sonoran Desert really comes alive at night once the sun goes down.” You’ll cross a river, explore one of Arizona’s turquoise mines, and explore Indian ruins. What makes Arizona Outdoor Fun unique? We have the largest fleet of off-road vehicles in the state, but we offer so much more than just off-roading adventures. This season, we’re introducing hiking tours, which we’re very excited about. We love to provide an adventure that the entire family can enjoy. To Arizona Outdoor Fun, nothing is more important than integrity, honesty and family. Your job title is the best! What does your job entail? What’s your favorite part of the job? I love my title. It took some getting used to though! I go out and build relationships. The best part is selling Arizona Outdoor Fun. I believe in our services which makes my job very enjoyable. It’s wonderful to work for a company that I can whole-heartedly support. Are all of the activities family friendly? We love to give families an adventure in the desert, but we want to prioritize safety first. We do have an age limit of seven and up to ride on any of our vehicles, and all drivers have to be 16 or older. Our trails are fairly technical; we want everyone to have a great time, but most of all, we want everyone to be safe. Why is it important for Arizona Outdoor Fun to support Make-A-Wish? Family is one of the core values of Arizona Outdoor Fun, so it was a natural choice for us to support a charity that could help bring hope to families and children with life-threatening illnesses. Make-A-Wish Arizona has granted nearly 5,000 wishes since it was founded in 1980, giving kids the courage and inspiration they need to battle their illnesses. We are proud to support Make-A-Wish and to give back to our community. There’s more than one way to cool off this summer and Arizona Outdoor Fun has them all. Pick your own adventure for a breathtaking desert experience. Don’t stay inside this summer. Get outside and cool off with thrilling adventures that will make your day – and help you keep cool. To learn more about Arizona Outdoor Fun, visit www.arizonaoutdoorfun.com or email info@arizonaoutdoorfun.com.